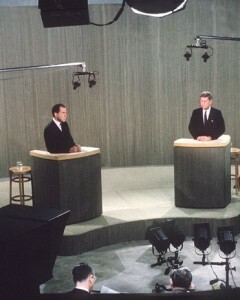 Until 1988, the League of Women Voters had organized and moderated the Presidential Debates as an independent 3rd party. They were responsible for moderation, selection of questions, location, and other details related to the debates. The only thing the candidates had to do, was show up. In 1987, the Democratic and Republican Party then jointly created a non-profit organization called the Commission on Presidential Debates. This commission secretly created a contract called a memorandum of understanding that decided which candidates would participate in the debates, which individuals would be panelists capable of asking questions, who could be in the audience… even the height of the podiums! Since the LWV’s departure from the debate process in 1987, the private, jointly-held Commission on Presidential Debates has run the debate process ever since. They control virtually aspect of what you see on television, including the exclusion of additional candidates. It’s important to remember that the CPD is a private organization – not accountable to the American people in any way. It’s also important to remember that this private organization is jointly run by the Democratic and Republican parties,. Since 1988, Memorandums of understanding have coordinated every debate, including the 2012 Romney-Obama debates. Twice, the memorandums have been made public (albeit unintentionally). 2012′s memorandum of understanding was 21 pages long, and forbade ‘direct questions from one candidate to another’, among many other things. And that’s why I didn’t watch the debates this year. No candidate can solve the Nation’s problems with 2-minute talking points, under the comfort of a debate organized by two organizations that are attempting to ‘perpetuate fraud on the American voter’. I have no intention of becoming an accessory to the hoodwinking of the American public. This entry was posted in Uncategorized on October 10, 2016 by I'm a Super .com.